I had two lovely surprises when I arrived home today. D was the first one to pick it up and he first thought the leaves were real. These are some of my favourite autumn colours so I am delighted with this. Thank you Wendy. The other was an ATC from Ayala from the Netherlands. 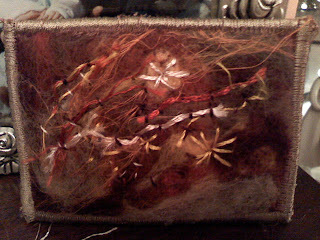 This is embellished needle felt and I love it. I am definitely going to have a go at needle felting. I have been wanting to have a go for a long time but after getting my hands on some, I just have to have a go. 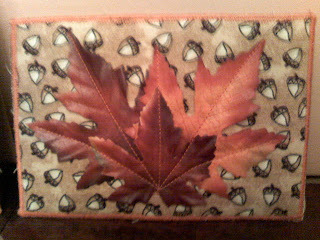 Ayala also enclosed a little parcel of autumn themed fabric to make some more ATC's. It looks so nice like this I haven't opened it yet. I'm going to wait until the boys are away one weekend and I can have all day to myself. Many thanks Ayala, really helped to make my day. I love those pretty fall colors, beautiful! How gorgeous are those? I love, love, love the colors. How lovely - such beautiful colours. What a happy mail you had! Love the ATC fabric card! Very pretty! Neddle felt card is gorgeous! It is so nice that your friend send some goddies to play with! 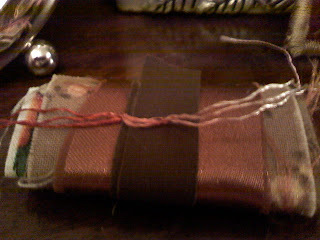 It is frustrating only doing a little stitching at a time though isnt it. I love your autumn gifts..such fantastic colours! Great surprises! I love the card idea! Got me thinking!